Like most I was appalled by the videos on YouTube showing the cavalier actions by Blackwater contractors engaging “targets” without any apparent rules of engagement which might have gone some way to determining if the vehicles bearing down on them on the highway were in fact a threat or not. I am not sure if there are any documented instances of there being a clearly identified threat – citizens in a hurry to make a doctors appointment or in some similar innocent scenario are gunned down from unmarked cars if they have the misfortune to say, try and overtake an unmarked Blackwater vehicle. I was in Baghdad when the Blackwater teams hammered 17 citizens when they thought they were coming under fire. 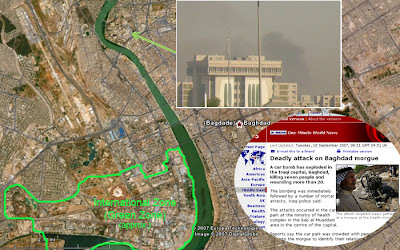 I am the first to appreciate how that impression can come about but for Blackwater this was only one of many incidents and the Iraqi’s have clearly had enough. I read today in the Washington Post that the FBI is having a hard look at the incident while the US DoD and State slug it out over the merits or otherwise of using companies like Blackwater. 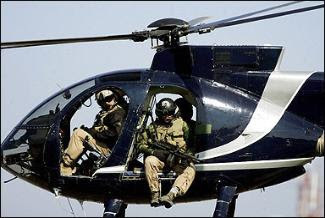 Fortunately the sunglassed, bandanna wearing Blackwater cowboys (the cowboy sobriquet also applies to those who fly these helicopters shown here) are not the whole story. I spent my time with a contracting company which provided not only security services but is intimately involved in the reconstruction efforts in Iraq. Their company operations are predominantly staffed by Iraqi nationals, they live and operate outside the International Zone, are committed to a genuine “hearts and minds” effort with all they deal with and are as integrated into the local scene as they can possibly be. I watched them deal with Iraq civil servants and was intrigued to see how they engaged and interacted with them, treated them as they would like to be treated themselves, were deferential and respectful. It is a far cry from the shoot first, ask questions later which damns Blackwater and their ilk. Use the contractors by all means (they allow the troops to focus on what the troops need to do) but the Iraq government could do worse than filter out those who have an interest in their contract dollars over and above their interests in the rebuilding of this community. Those security contractors who have a philanthropic and compassionate agenda within their business goals do exist. (And no, I am not employed by one, just in case you thought this was a self serving plug). The muse have fled, or so it would seem. Best I have been able to do these last ten days is drag out an old journal entry from the Solomons! I drove from the airport directly to work and had half a day at the desk before I headed home before I fell asleep in the office. And as I did so, through newly sprung maples and watching sulphur crested cockatoos playing in the wires near home I thought how safe and boring it all was. I thought I would still have insights and things to say about the place but by the time I resurfaced a week later from Board meetings and other distractions I discovered the stimulation of the place had been fuel to my muse and now I regret constraining myself to an entry a day. If that environment was stimulating to the muse then this environment is enervating, something I had not really appreciated before. Sure, the alertness and “liveness” I felt in Baghdad revisited previous jobs in edgy places that I have enjoyed in the past. But I had not appreciated the impact the environment has on my creativity or on the desire to pry into what makes things and people tick. 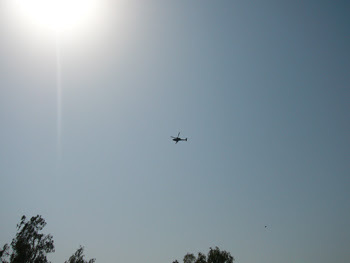 I could talk about the sound of news choppers here and all that is trite and mundane when those sort of comparative exercises are worked through but I suspect they would be seen for the contrived efforts they could only be. Perhaps rather a note here that I have some images seared into my mind as the visit recedes into history. The face of a driver of an old Datsun as we passed him on the road out of Baghdad – eyes reflecting the shrieking silent fear of being out there on his own (while I took some consolation in my protective armour and team). A solitary middle aged figure standing in front of his empty shop, gazing at us as we swooshed past. The faces and poses of men standing outside their cars with their hands up – just in case. Indolent soldiers on the street behind their anti aircraft cannons. Three men standing by the Tigris with nothing to do. Watching us closely and our own security people getting edgy under the idle scrutiny. Old women chatting in front of blasted shops, as if there was no war happening at all. A woman and her small daughter pulling along the sidewalk as fast as they could go, not looking around for anyone or anything. Other children going to school as if this was a normal street – they and that attitude will be the salvation of Iraq. Rows and rows of blank faces waiting outside the ministry, with no work, no place to go, no home to return to with any dignity. Best to look like you have been at work all day. Smoke on the horizon marking someones ruination. Silent shadows appearing over the Tigris and settling into their nest on the banks of the Tigris, choppers of all types silently returning from whatever they had been up to. Faces. Faces. And more faces. I need to get back there. Soon. 970,000 American Casualties. Is Iraq Worth It? Naturally even departing Baghdad is extraordinary. How many international airports require you to pull over on the approach road, empty your magazines and then dry-fire your weapons to demonstrate nothing is “live”? No others spring to mind. Then drop your bags on the road outside, in a large concrete revetment while a bomb dog crawls over your gear. Then imagine a third world mess inside – at least in terms of organisation and graft. 8kg underweight (baggage that is) and I am still up for USD25 for excess baggage. But if you want out of here…! I happily paid up. All of that will sort itself out in the end. I am normally a very patient traveller but by the time I got to Jordan and endured my ninth bag check I was feeling very irascible. 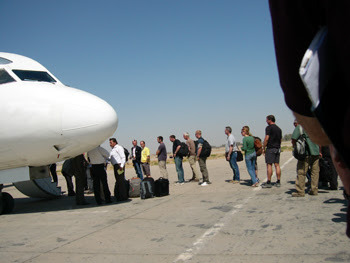 Even after being dropped off at the aircraft in the Baghdad heat there was a pat down and bag check. You do what you have to do. To answer the question, the short answer is yes. Not only from a personal business point of view but also from a broader perspective as well. This place is on the mend but there is no denying it has a way to go. And it is on the mend because local Iraqis are resolved to mend it. Be they the occasional and too infrequently met local, the public servants or the young diplomat I met in the queue waiting to check in this morning. He and a few others were off to Rome to do a course. He has high hopes for Iraq and his belief in what was possible was heart warming and encouraging. People like this make the effort worthwhile I think. Interestingly we discussed the convulsions that have been at the root of the building of other nations. Starting with the US – which is “united” at the cost of more than 970,000 of its citizens dead and wounded. Can you imagine that body-count being reported in today’s press? About the same number of Americans killed by each other as perished in WWII. (And as a footnote is it not interesting that the US had a 12 year Reconstruction period after its civil war? We all want Iraqis to sort themselves out in a couple of years!). Japan. France. Even present day Russia. Vietnam. India. South Africa. The Balkan states. If we could forge nations in other ways we could and should. But sometimes it happens in the worst way. We parted with a handshake (when I was called to a spare seat on an earlier flight (not everything that happens in Baghdad is bad!!)) and a controversial observation – he cocked one of his eyebrows at me and wryly noted that none of their Arab brothers were coming to their aid – it was all the Christian states who were helping, and he said Iraq would always remember its friends. This young man has an interesting diplomatic career in front of him to say the least. But it is that freedom of expression that comes with all other freedoms that we all want to see in Iraq. He said something he would not have dared utter five years ago. Now he feels free to voice his views to a stranger. If we can achieve that, without him eventually becoming a casualty for his forwardness, then Iraq’s people are worth it. At about 11pm a half moon hangs in the sky. I’m sitting on a flat roof reclining in a dusty poolside recliner (though there is no pool), in a hot breeze. Just listening and watching. It is still but not quiet. This city does not sleep. But it is a softer city in this dusky light. Frogs among the eucalypts rhythm their quiet and indolent blues. Distant mosques broadcast their calls and prayers in a melodic tone that is beguiling, a soft chorus that hints at more civil and ordered things. Of better things. The normal city background rumble of traffic adds its background hum. Flares drift down through the trees. 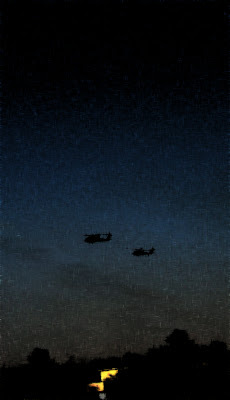 Silent, and betraying an unheard and unseen helicopter. Occasionally the drone of piston engines carefully buzzing their surveillance, also unseen. Drifting in and out of the peaceful stillness. Which is broken every now and then by Pumas or Blackhawks thundering in pairs over the house, roaring in then fading out swiftly. Leaving us again to the mullahs and the frogs. A civil airliner flashes its strobes as it lazes its line north, unlike the unseen military jets that occasionally bore through the sky. In and out much more quickly. I am out of here tomorrow and I find myself up here in a reflective mood. There is nothing like being here, if only briefly, to appreciate just how critical the momentum needs to be maintained in getting this place on its feet. It can be done, and it is a work well underway. There are moments when you worry about the place, as we did this afternoon when four or five “booms” carried to us on the wind. Initially we thought they were artillery but eventually decided they were bombs. Unlike hearing them in the news, these carry a clear personal message – that someone has been hurt, and for no reason. Somehow those blasts now seem a lifetime ago as I sit up here under the moonlight and soak up the evening. The frogs are now the constant background theme, far better than the murderous noises heard earlier and throughout this visit. I am hopeful that with some perseverance Malik and others like him will soon be able to relax and get back to their rooftops in the evening, the “booms” being only a bad memory from a distant era. I certainly pray so. Shouts and commands from behind a walled compound yesterday had me carefully checking over the roof balustrade. It all sounded a bit urgent and well, commando-ish. The wall encloses a large park like area and through the trees I could see AK47 armed, headband wrapped men dashing forward and heading our way. I had to decide whether this was a training exercise or whether I should be thinking about making myself scarce. Just at the point I was thinking I needed to scamper someone called a drink break. Phew. On another boundary a short time later the complete antithesis (there is a word for CT) with squeals of terror mixed with laughter getting my attention. That had me intrigued and when I checked it out I could barely contain my own laughter. There has been a lot of construction work next door and the place has been busy with burly, deeply tanned men, most of the them large and muscular, pouring concrete, shaping steel and sweating their hearts out in the sun. The site is now largely done and painters have been in. These blue singleted, bearded, tough men were squealing like 6 year old school girls (that stereotype remains) as they tried to get out of the way of a lizard. One of the men had managed to catch the reptile and was chasing his colleagues with it. They were all flapping their hands in horror, squealing and trying to get to vantage points such as truck decks or cabs. Any stereotype of construction workers, Arab or otherwise vanished in a heartbeat. And at the end the lizard was carefully let down in a shady pool of water, no doubt terrorised by his adventure with these guys. 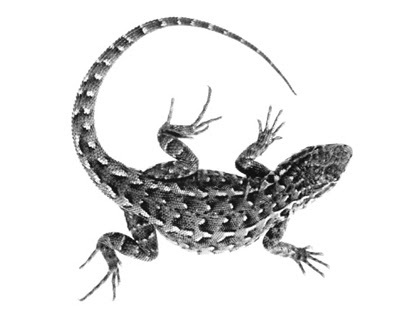 In a land of indiscriminate death it was nice to see the lizard get off lightly. I was going to leave off writing about Baghdad for a spell – it becomes a bit self absorbing after a while. Then this morning a bomb rattled the windows. As I got to the roof only seconds later to get a fix on the location a second one went off. The smoke from the first was starting to disperse in the stiff breeze but soon the smoke from the second was roiling up. Ten minutes later the whole sky was smudged by it. My point of reference is the GBU10s and GBU12s, dropped onto air force weapons ranges. As I went out onto the roof I thought to myself “that felt like a GBU12” – 500lb of “bang”. In the event I don’t think there was that much explosive but it was 5km away and still rattled the windows. It is a sobering thing to watch as you realise you are witness to someone’s day being ruined – all for nothing as Malik would say. But it is sobering for other reasons as well. The delight at watching aircraft fly around now becomes a guilty sin. Being on the edge and feeling alive is now at someone else’s expense. At the expense of real people I have met in the street. And you feel equal measures guilty and equal measures angry for what the incident becomes to everyone else – meaningless or irrelevant. A non event. A tree falling in the forest unheard. The booming crump and the shuddering glass never makes it to most of the on-line papers around the world. Heck, it barely makes the coverage of those carrying Iraq news. The BBC carries a small article. I confess I am surprised that only 7 people are killed, 20 are wounded. The blast felt bigger than that. People bombed lining up at the hospital to identify dead relatives. Obscene, cowardly, diabolical. I am offended by that. But also by the normalcy such a “small” blast has become. By the fact that no one else in town turns their head (no doubt relieved they were not incidental to its maw). I am offended for these victims that the press got it wrong – there were two blasts. And the lack of human touch in the press – who is that man, and what is his story? His pain? And what are we doing about it? The memorial stain of smoke over the sky is an obscenity as well, in part for its brevity. Who of us in our own cities would tolerate a stain like that? No, I thought not. But here it has become part of the grist of life and barely stirs a ripple. An inexplicable sadness for that knots my stomach for the day. I don’t know what else to say.